THEM Anime Reviews 4.0 - Phantom Quest Corp.
Notes: One minor linguistic quibble: on the box, the Japanese characters are transliterated You-Gen-Kai-Sya, but that isn't quite phonetically correct. "You" in Japanese sounds like "yo", as in, "Yo, what's up?" Using "Sya" rather than "Sha" is correct, if you're using Kunreisiki/Nipponsiki system of romanization rather than the Hepburn system that we use on this site. In the Shinjuku district, an area stuffed to bursting full of businesses of all types, there is a corporation of a rather...unusual nature. 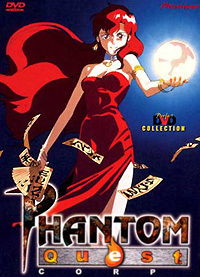 The Phantom Quest Corporation (or Yuu-Gen-Kai-Sya), run by the lovely (but somewhat irresponsible) Ayaka Kisaragi, devotes its business to helping anyone with a problem with spooks, specters, or spirits. With her select (and hilariously quirky) team of horror-halters, no supernatural is safe with Ayaka on the case! Heh heh. And now, for something completely different. You could say that Phantom Quest Corporation is like Ghostbusters meets The X-Files meets Sledge Hammer!, but that wouldn't even begin to come close to accurately summing up this title. Let's just say that PQC is all of that, and none of that at all, and then some, okay? Animation and artwise, Pioneer has done it again with another good-looker to add to its repertoire. The clean, sharp stylization that has been so associated with anime is present in spades, and the scenery is colorful and bright. The soundtrack is nice and over-dramatic, letting you know that, no, you're not supposed to take any of this stuff too seriously (watch the opening sequence to update your definition of "melodrama"). Yes, the stories are a bit on the silly side (when's the last time you ever met an anemic vampire? ), but remember, you're not supposed to take this stuff too seriously. The plots do sober up a bit (and improve) for the second volume, but the hilarious characters that make up the Phantom Quest Corporation do more than an adequate job of keeping things light. My only complaint is that the title never does develop some of its characters more fully (is it just me, or is Nanami Rokugo one of the cutest characters to ever grace the screen?). Looking for a title that shows the lighter side of the dark side? Give Miss Ayaka a call. Recommended Audience: There are a few scenes of a mature nature in the second volume, and both tapes contain innuendo that might not be appropriate for kids. Also, don't forget the courtesy shots we get of Ayaka in the morning (yeesh! Doesn't anyone sleep _clothed_ anymore?). Some real (i.e. people get hurt/killed) violence, too. Some parents may be offended by the occult references present.